POSTED November 29, 2018 12:28 p.m.
PLATTEVILLE — Edgerton ended Platteville’s season a year ago in the WIAA Division 3 sectional semifinals. Monday night Isaiah Oswald and his Hillmen teammates got a measure of revenge. The sweet-shooting senior buried 7 of 11 3-point attempts and scored a career-high 28 points to lead Platteville to a nail-biting 61–60 victory over the visiting Crimson Tide Monday at Platteville High School. Oswald’s seventh triple of the night gave the Hillmen a 60–58 lead with 1:35 left and fellow senior Andy Eggers split a pair of free throws to give Platteville a three-point lead with 13 seconds left. 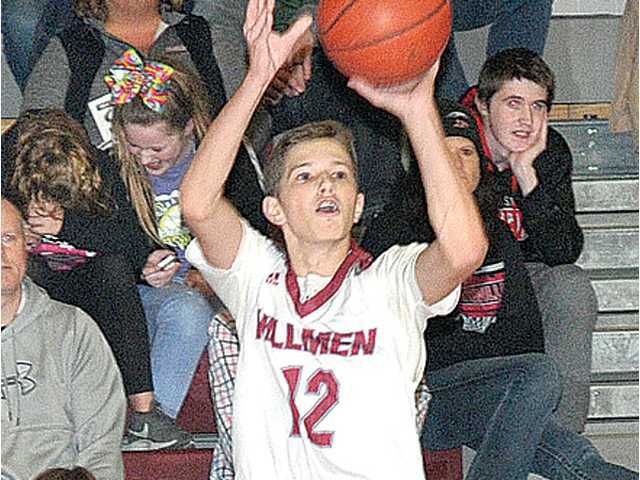 Edgerton’s Scott Willie was fouled attempting a game-tying 3-pointer with 0.2 seconds left and made the first two free throws, but the potential game-tying attempt rimmed out and the Hillmen claimed their first win of the early season. “Isaiah got himself into a rhythm on offense early and his teammates did a really good job of getting him the ball in positions where he could catch it and get his shot off quickly,” said Platteville head coach Mike Huser. “He made a big shot to put us late in the game. Eggers finished with nine points, four rebounds and two steals. Fellow senior Cade Rohrbach added four points, nine assists and eight rebounds. Senior forwards Connor Rilley (6 points, 10 rebounds) and Trey Bartels (6 points, 4 rebounds) combined for 12 points and 14 boards. Brian Rusch scored a team-high 17 points to lead Edgerton (0–1) in its season-opener. Huser’s Hillmen opened the 2018–19 season with a 60–44 non-conference loss at Mount Horeb last Tuesday night in a battle of preseason conference favorites. Senior Bryce Farnsworth scored a game-high 19 points to lead the Vikings, who opened the season ranked ninth in Division 2 and are the preseason pick to win the Badger North. Gunner Nortman (13 points), Jason Larson (12) and Dustin Zenz (10) also scored in double figures for Mount Horeb (1–0). The defending SWC champion Hillmen (0–1), who are ranked ninth in Division 3 to open the season, fell behind late in the second half and never recovered. Platteville led 13–11, but the Vikings buried three straight 3-pointers and a pair of free throws to build a 22–13 lead and led 30–17 at the half. Platteville scored six straight points early in the second half to cut the deficit to 32–24, but Mount Horeb survived the Hillmen run and eventually pushed the lead to 18 points midway through the second half. Senior forward Brandon Weigel provided solid minutes off the bench and led the Hillmen in scoring with a career high 11 points to go along with four rebounds. Senior point guard Cade Rohrbach added nine point and seven boards in the loss. Platteville shot just 25.7 percent (9 of 35) from the field, including just 4 of 21 (19.1 percent) from behind the 3-point line. Edgerton (0–1) — Clayton Jenny 7, Drew Hanson 4, Brian Rusch 17, Peyton Fox 5, Ethan Norland 7, Kyle Wille 13, Nick Sang 7. Totals – 23 7-10 60. Platteville (1–1) — Andy Eggers 9, Austin Wein 3, Cade Rohrbach 4, Isaiah Oswald 28, Brandon Weigel 5, Connor Riley 6, Trey Bartels 6. Totals – 21 9-13 61. 3-point goals — P: 10 (Eggers 1, Rohrbach 2, Oswald 7), E: 7 (Jenny 1, Rusch 4, Fox 1, Wille 1). Total fouls — P: 11, E: 13. Fouled out — none. Platteville (0–1) — Andy Eggers 5, Cade Rohrbach 9, Isaiah Oswald 6, Gabe Tashner 3, Brandon Weigel 11, Connor Riley 4, Trey Bartels 5. Totals – 11 18-34 44. Mount Horeb (1–0) — Dustin Zenz 10, Bryce Farnsworth 19, Gunnar Nortman 13, Jason Larson 12, Logan Rasmussen 6. Totals – 18 18-22 60. 3-point goals — P: 4 (Eggers 1, Oswald 1, Rohrbach 1, Tashner 1); MH: 6 (Nortman 1, Zenz 1, Farnsworth 2, Rasmussen 2). Total fouls — P: 31, MH: 21. Fouled out — P: Bartels, MH: Rasmussen.